Crop circles - Dangerous health effects - anomalies. Explanation, decipher, decode, discovery, break code, explaining, decryption, puzzle out, scientific research. Very serious warning !!! You are visiting any Crop Circle place at your own risk. There may be present high concentrations of really very dangerous poisons, mostly CO (Carbon Monoxide - Invisible Killer). Also carbon dioxide, risk organic poissons, complicated Carbon and Silicium compounds. Discharge of lightning, which transmits in the case of above-average specimens such a quantity of energy, thanks to that would a lot loaded freight train circle several times around the globe, is able to produce such a great quantity of underground toxic chemicals, that would be able to intoxicate and kill population of entire cities. Only due to the fact that they are released toward the surface very slowly, and also because the vast majority of them are very reactive agents, that within a few centimeters of movement through underground structures immediately react with the surroundings and with each other and thanks to that the vast majority of them (fortunately) recombines to form products considerably less dangerous or completely non-toxic. This is one of the main reasons, to that a lot of people, who have ever visited Crop Circles, owe for that thay are still alive. However, quite a number of toxic substances in the underground may continue to reside, during visit any observer. It is possible to observe that some people in these places behave in very unusual ways. "Someones are in shape meditating, others praying, someone snuffling ground etc.."
For example, one of the most famous observer of the phenomenon known as crop circles, Lucy Pringle, describes on one or two pages of her website quite right typical symptoms of people poisoned by sublethal doses of deadly toxic compounds or drugs, is possible to ask about that any toxicologist. Anyway, all of them are under the influence, there may occur and affect Carbon Monoxide - CO (and very likely it is really there). Many described symptoms are similar to that from toxicological publications, as if they were copied from there. Also there may be an excess of carbon dioxide CO2, present so that observers can easily be choked a little, and consequences in this case can be very similar to the effects of drugs. Symptoms also described in toxicological publications. (normal content in the air - 0,03%; 2% - first symptoms of poisoning, 5% - headache, 20% - death). Very strong recommendation for all Crop Circle visitors anytime in the future. Take there CO and CO2 concentration meters in the air, or just prefer to invite a workers of a Toxicology Laboratory. Sometime later, here will be reported more symptoms, that is not possible to apply only as an effect of CO and CO2. Metallic taste, also described on the website L.P., that is typical for example when lead poisoning (whose compounds in the field would be really difficult to find). The same effect may appear also due to some organic compounds, that would be created in soil exposed to enormous energy, high voltage, electrolysis and thermochemical processes. See for example Lucy Pringle pages. 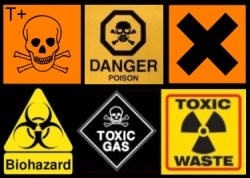 Decades repeatedly accompanies those interested in places, where may appear high concentrations of Extremely Dangerous Poisons, what can be relatively easily detected from described symptoms (some of them are really very typical for drug abusement). Toxicologists will similar activity definitely not praise. As well as a local sawbones, which was likely sometimes been consulted about the effects of exposure that local conditions to "guinea pigs" going there. Pilots who showered Chernobyl reactor by sand from a helicopter when they staggered after three overflights from a helicopter and walked into the bushes to vomit, described just a metallic taste. It is possible only ask those who survived to the present days. Also possible, that in the soil due to electrolysis, high-voltage and high-temperature dissociation is created considerable amounts of of atomic hydrogen, is known to react much more readily and may induce emergence of a variety of hazardous compounds for plant and animal organisms. Part of it may be present for a short time as a plasma. 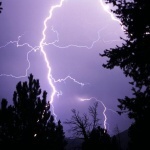 Certainly it is very easily verifiable fact that on the site affected by lightning may occur many "very specific compounds", free radicals, compounds of any elements present in the soil with high oxidation numbers, that there are usually absent. They are generally considerably always more toxic, thanks to much higher redox potential: without oxygen in the form of O2 life would not exist, while all its compounds, where is more than divalent are highly toxic. There may occur also ozone O3 and its reaction products, gaseous silicates and other substances, very harm to health. It is interesting that the security authorities in this respect have not yet started closer interest in this issue. Flower children of drug squats with are visiting that places as if there was distributed beer free of charge - free of charge, gratis, gratuitously, buckshee. Her Majesty might have activated some of her Secret Services, James Bond just has nothing to do, not to mention of inspector Clouseau. As already mentioned on other pages of this site, the best characteristic of activities, that the vast majority of Crop Circles visitors are quite unwittingly indulging in, is "exposition to sublethal doses of deadly poisonous chemicals", which in most cases almost indistinguishable from the effects of drug exposure. All the drugs are actually deadly poisonous substances (for example nicotine, alcohol), served in sublethal doses. They state man into the condition in which death is much closer to him than in other circumstances (someone says adrenaline), and speed freaks are happy to indulge in this situation, also repeatedly. There's nothing for all visitors in the Crop Circles around the world than strongly warn to really put a lot of attention. They had to have, yet very subliminally, and above all completely unwittingly, poised to become one of the speed freaks (more precisely, those of them who are not yet). The good news for them may be the message, that after reading and understanding this information they can already continue to quite deliberately. Among other things, often comes also palpitations, and arrhythmias. Metallic taste: as typical example lead poisoning, but also many organic poisons, not containing any metal. For example, after rattlesnake bite. CO2: (p. 592) During increased concentrations evolves tachypnoe, headaches, perspiration, restlessness, confusion and increased excitability. May follow apathy, convulsions and coma. read it for yourself, by your own, please.